If you love playing fantasy games then playing casino games would be a natural fit for you. Many Americans who are involved in football fantasy often bet on sports and play real money casino games as well. If this sounds like something you might be interested in, then check out the SuperBowlBets.com. Let's start things off by going through some IDP news, notes, and commentary from Week 15 of the NFL season. Last week saw a rash of injuries to fairly significant IDP linebackers, which couldn't have come at a worse time for most fantasy owners as we are entering into championship week. Perhaps the most significant of these injuries was to Chris Borland who suffered an ankle injury during last week's game and could be done for the rest of the season. He will be replaced by 2nd year player Nick Moody. I'm not sure how much I would trust Moody with a fantasy championship on the line. His overall playing time is a bit of a question mark. I'd think of him more as a desperation LB4 in 10-12 leagues. Michael Wilhoite is the better option of the two and gets a bump in value from LB4 into the LB3- range. The Broncos were hit hard at the linebacker position as MLB Brandon Marshall suffered a potential Linsfranc sprain in his foot and WLB Danny Trevathan suffered a dislocated kneecap (Trevathan is out the rest of the year. Marshall likely is as well.). Although there is obviously some nice fantasy potential up for grabs here, it's a situation I would avoid. Nobody (probably including Denver) knows who will replace these two players and at what capacity. Lamin Barrow, Steven Johnson, Todd Davis, and Corey Nelson are all potential candidates. Davis is probably the most likely to start probably followed by Johnson. My instincts tells me that no one player will play every down and that we could likely to see a good amount of rotation. Let's make sure to continue to watch the practice reports throughout the week to see if we can get some type of indication of who is going to play. But it's shaping up to be a fantasy wasteland. The Raiders placed Sio Moore on injured reserve with a hip injury. He will be replaced in the lineup by Ray-Ray Armstrong who will be close to an every down player but really doesn't have a ton of fantasy value. Donald Butler was placed on IR by the Chargers after dislocating his elbow. He had been demoted to a base only role anyway, so not a huge loss for owners. I'm going to keep an eye on Manti Te'o over the next two weeks and see if he sticks in subpackages. If he does, he'll be a nice sleeper option heading into 2015. Similar to the Broncos, the Bengals saw two of their starting linebackers go down with injury and not return. IDP darling Vinny Rey suffered a concussion and Emmanuel Lamur pulled a hamstring. Rey was cleared through the concussion protocol on Sunday and should start in Week 16. Lamur missed practice on Thursday and is less likely to play. The way things are shaping up, Rey could be a nice LB3+ start (his value get's hurt by the assist-heavy Cincy stat crew). Josh Mauga went down with an oblique injury in last week's game. He practiced in full today however and should be all systems go against a run-heavy Steelers team. Trent Cole broke his hand and will not play Sunday. This opens the door for Brandon Graham to have more of a full-time role, at least in the short term. Graham has been an absolute stud on a per snap basis this season and has been drastically underutilized. This said, let's hope he puts up some big numbers and starts getting the appreciation he deserves. After being out over a month, rookie Ryan Shazier was back on the active roster. However, he only played 4 snaps and those came in replace of Lawrence Timmons who shortly exited with an injury. I wouldn't expect much out of Shazier the rest of the season, but he will enter 2015 as a viable LB2- option. The 49ers released Ray McDonald after his latest off-the-field incident in which he is being accused of sexual assault. Although there was speculation in the media that Kenny Vaccaro would be benched, he ended up playing in 44 of the team's 63 snaps. He's definitely drastically underperformed fantasy-wise this season for owners. Let's hope he gets back on the right track next year. Both Robert Quinn and Ezekiel Ansah laid 1 tackle performances last week in great matchups. Although owners are discouraged with both players, their upside is too great to leave out of your lineups. I'm going to continue rolling them out there. It looks like the Packers may be done experimenting with Clay Matthews at inside linebacker. He primarily played outside last week with Sam Barrington and AJ Hawk on the inside during base packages. Matthews still has value as a matchup LB3 in most leagues, but he's not a near every week start anymore. 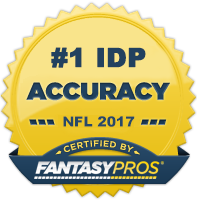 Now onto The Guru's IDP waiver wire selections for Week 16! DE Chandler Jones (NE) - After a seven week absence, Jones finally returned to the starting lineup against the Dolphins last week. The Patriots wasted no time in getting him fully integrated back into the defense as Jones played in 56 of the team's 81 snaps. He registered 7 tackles and 1.5 sacks and projects to be a top 5ish play against the Jets poor pass-blocking line this week. He's likely not available in most leagues, but if he is or he's currently on your bench, it's time to start him again. DE Jurrell Casey (TEN) - Casey has only had 1 sack over his last eight games, but that is likely to change for the better after going against the ragtag line of the Jaguars this week. The last time Casey played Jacksonville, he had 7 solo tackles, 2 assists, and 2 sacks. Now is the time to get him back in your lineups. DT Fletcher Cox/DE Cedric Thornton (PHI) - The Redskins are now the 2nd most heavily sacked team behind the Jaguars. Cox has been the more consistent option between the two players listed and would be my first choice off the waiver wire; however, he's likely owned in a lot of leagues. If that's the case, Thornton makes a nice dart shot DL3 this week. WLB Craig Robertson (CLE) - Robertson has been a LB2+/LB1- since Karlos Dansby went out with an injury. There's a chance the latter returns this week, but if he doesn't, Robertson should be in your lineup. He's averaged 10+ total tackles over his last five games and has the Panthers on the schedule this week who have given up the most fantasy points to opposing linebackers. WLB Gerald Hodges (MIN) - Anthony Barr did not practice today and is unlikely to play this week, so Hodges should be in an every down role against the Dolphins. The matchup isn't great but he posted a 7-2 stat line against a similar matchup last week. Solid LB3 option for owners in 10 and 12 team leagues. WLB Christian Jones/MLB Jon Bostic (CHI) - Jones looked comfortable in an every down role last week and posted an impressive 8-5 stat line. With Jimmy Clausen starting this week against the Lions there's a good chance the Bears defense spends a lot of time on the field. Consider him a high variance LB3 with good upside. Jon Bostic is a higher floor/lower ceiling option of the two. MLB Danny Lansanah (TB) - As Mason Foster and Lavonte David have struggled with injury issues over the last several weeks, Lansanah has emerged as a solid all-around option for the Bucs. I believe even when Foster returns, Lansanah will stick in the nickel packages with David. The Packers are one of the more poor matchups, but I'd still absolutely start Lansanah as a LB4 in shallower leagues. He's definitely a player to keep an eye on heading into next season. WLB Devon Kennard (NYG) - Rookie Devon Kennard has been on fire over his last three games putting up lines of 3-3-2, 6-2-2 FF, 7-2-0.5 FF. He's still not playing every down, but the Rams have been a great matchup for linebackers and aren't likely to push the Giants into many subpackages. He'll be a boom/bust LB3 and a good option for underdog owners in need of big points. S Kemal Ishmael (ATL) - It's looking like William Moore is going to be miss another week which makes Ismael a nice start once again. 7-8 total tackles is a reasonable projection for him against the Saints. Feel free to slide him into your DB2 slot. S Ryan Clark (WAS) - Clark's seen a slight uptick in production with Brandon Meriweather out. With the Eagles coming to town, he's set up for one of his better fantasy games of the year. Philadelphia is allowing over 54 tackle opportunities a game and have been an absolutely fantastic matchup for safeties this season. Very appealing DB3-DB3+ play. S Bradley McDougald (TB) - McDougald exploded for 15 tackles (11 solos) against the Panthers last week. He'll start again this week against the explosive offense of the Packers. The Bucs strong safety position has shown flashes of fantasy potential this season, so I don't think the production is a complete aberration. He'll be a top 30 play this week. S Patrick Chung (NE) - Chung is coming off a 10 tackle performance against the Dolphins last week. The division matchup against the Jets should bode well for him as he had 8 tackles when the two teams last played in Week 7. With the game being in New York, he will get a little added boost from their generous home stat crew. DB3+.